Home | MoM answers | Can you help me find a recipe? My mum used to make this recipe too. Brings back so many memories. Stuffed capiscums and rice are also my long lost recipe l haven’t made in years,so good! 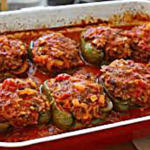 Love these capsicum recipes and hope you find your recipe too. yumm both of these recipes sound delicious …Tina has two wonderful recipes to alternate between. Cook your diced onion, diced capsicum and diced carrot in a little olive oil until it is all cooked, coloured and tasty. Now take the pan off the heat and add minced meat, cooked rice, garlic, oregano, italian parsley, salt and pepper to taste. Mix in the cooled pan with two teaspoons of extra virgin olive oil to achieve a great smelling paste, add the chilli if required. Slice the cap with the stalk off your capsicums and remove all seeds and white pith inside the capsicums. Fill the capsicums with mix and put the lid on. If the capsicums will not stand up straight, cut a tiny bit off the bottom so they will stand alone in the shallow roasting pan. Roast in oven at approximately 200 degrees C for 30 minutes without the stalky lid hat. Now pour the hot napolitana sauce over the capsicum. It will flow over the stuffing and down the sides, put the capsicum lid on and roast for 30 to 60 minutes until cooked through and capsicums are tender. Enjoy!